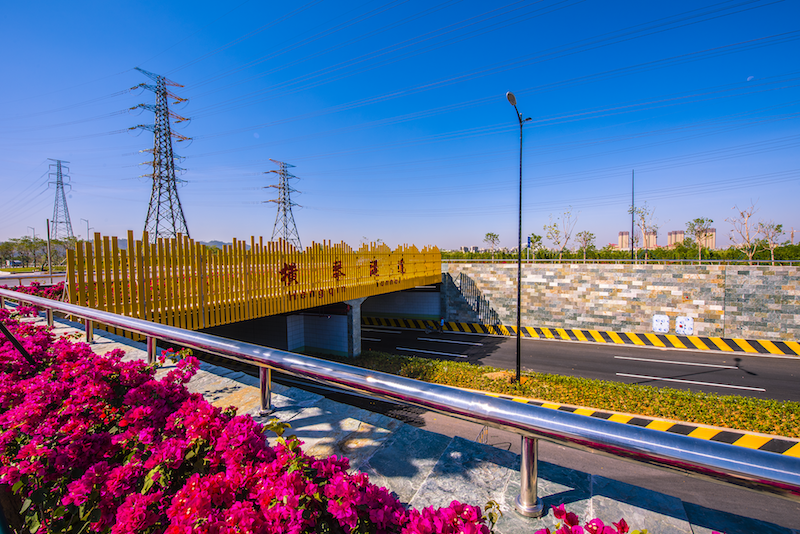 The shallow-buried integrated tunnel is the only passenger vehicle-dedicated channel in Hengqin New Area to offer shelter from severe weather. It is a major part of a new roadway project running 2,837 meters and with three lanes each way, from Central Avenue in the south traversing North Ring Road (North Huandao Avenue). The tunnel has an inner diameter of 14.5 meters and is 2,244 meters long. It passes under the Maliuzhou Waterway, after which it was formerly named, and will proceed northward along a proposed Baozhong Road to Nanwan Avenue in Wanzai. Speeds in the tunnel are set at 60 km/h. Innovative methods were applied in difficult compound strata to construct the tunnel, the first such attempt in China’s history according to a project leader. Under the tunnel is an integrated utility system. This is the third traffic artery to Hengqin New Area from downtown Zhuhai, joining the Hengqin and Second Hengqin bridges. It is of great significance to the integration of Hengqin, Hongwan and the Zhuhai Free Trade Zone. The tunnel was constructed by Zhuhai Da Heng Qin Investment and overseen by the Administrative Committee of Hengqin New Area. During the ceremony, the Preparatory Office for Macau’s Featured Financial Service Base also unveiled its plaque. The plaza is one of the first Macau SAR recommended entrants into Guangdong-Macau Cooperation Industrial Park in Hengqin New Area. Themed “Dialogue with the New Era”, the 4th China Reform (Hengqin) Forum was held in Hengqin on 7 September. This week, Xu Mu explains how Inno Valley HQ helps incubate setup enterprises. Hengqin Record sat down with Xu Mu, General Manager of HQFI Innovalley Incubator Management Co., Ltd to discuss how the Valley HQ operates and who can get help there. This is part one of the interview, with part two to follow next week. The season-ending WTA Elite Trophy Zhuhai, to be held in Hengqin New Area from 30 October to 4 November 2018, has announced its full lineup.